Temperature is a major environmental factor affecting the plant growth and development worldwide. Low and high temperatures are considered as the major environmental stresses for crop plants. Global climate changes have triggered the occurrence and frequency of temperature extremes, thus these stresses are becoming the major concern for the plant researchers around the globe. Both these stresses have devastating effects on metabolism, growth, and development of plants. Rice, a major cereal crop, is sensitive to low and high temperature stresses. The optimal temperature for the rice cultivation is 25–35 °C, and temperature below or higher than optimal negatively affects the growth, physiology, and yield of crop. High temperature (>35 °C) negatively affects the growth of roots and shoots, hampers pollination, causes poor anther dehiscence, and leads to spikelet sterility. 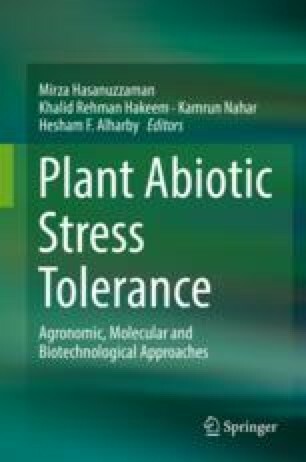 However, the responses of rice to high temperature stress vary with the extent of temperature increase and its duration. Likewise, low temperature (<20 °C) delays rice germination and seedling establishment, hampers tiller formation, affects flowering, causes panicle sterility, and finally leads to lower grain yield. In this chapter, we summarized the studies regarding the effect of temperature extremes (heat and cold) on different growth stages of rice, and discussed the possible strategies and opportunities for improving the rice tolerance to heat and cold stresses.